The day sheet displays charges, payments, adjustments, and unearned revenue for your organization, locations, and individual providers for a specified date range. Important: Only one user per location can generate the day sheet at any given time. On the Home menu, under Reports, click (or tap) Day Sheet. The Day Sheet page opens. Select the All check box to view transactions and transaction type totals for all locations in the organization. Or, clear the check box to not view transactions and transaction type totals for any locations in the organization. Select or clear the check box next to the current location name to view or to not view the transactions and transaction type totals for that location. Click Select Locations to select or deselect locations. Include Organization Summary - To view the organization's transaction type totals (the sum of the totals for all locations in the organization), select the check box. Date Range - The date or date range of transactions to include on the report. Leave the current date selected, or select the desired date (today, yesterday, or a specific date) or date range (last 7 days, last 30 days, this month, or a custom range). Report Type - The types of transactions to include on the report. Select whether you want to view the full report, only the payments received, or only the adjustments made. Provider - The provider totals to include on the report. Click (or tap) a white space in the box to display a list. 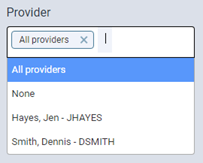 Then, select All providers to display totals for each provider in addition to the practice totals, None to not display totals for any provider, or a provider to view that provider's totals. To include totals for multiple providers, you must select each provider one at a time. Note: To remove the All providers item or a selected provider, click (or tap) the corresponding X. To include those payments that have a specific tag attached, click (or tap) the corresponding tag button as needed to make a green stripe appear on the left side of the button. To include those payments that do not have a specific tag attached, click (or tap) the corresponding tag button as needed to make a red stripe appear on the left side of the button. To include payments whether or not they have a specific tag attached, click (or tap) the corresponding tag button as needed to make the button not have a colored stripe, or do not click (or tap) the button if it already does not have a stripe. On the message that appears, click (or tap) Continue. What constitutes a New Patient? Why does Applied Payments on the day sheet not match the Collection Detail report? How can I match the procedure charges on the day sheet with Power Reporting? We do plan to have the option to run day for individual providers with our custom reports starting within a few months. I did want to share a workaround for this idea. You are able to drag over the procedure/payment/adjustments section of the day sheet to select all of the information. Then you can copy and paste it into Excel where you can sort it by the provider column (note whether you copied the headers). This will allow you to see the production for each provider. Unfortunately, it does not show a provider for payments or adjustments. Applied payments are payments attached to procedures also within the date range of the day sheet. So if you ran the day sheet from April 1 to April 30, you could have a procedure earlier in the month but the payment was later that same month. Unapplied payments are not attached to a procedure in that same date range. This can be that they are not attached to a procedure at all, or the procedure isn't in that range. An example here would be if the procedure was in March, but the payment was in April. You add them together to get total payments in that month and can compare the sum to the payment analysis report.